Chiropractic medicine has been practiced for over 100 years. It is a natural form of medicine that focuses on examining and evaluating the muscles, joints, and nerves, particularly the spine, to determine if anything is interfering with these areas and causing abnormal body function. This branch of medicine is based on the belief that good health care depends, in part, upon a normally functioning nervous system and that the body has its own mechanisms to maintain health naturally. Chiropractors, such as Dr. Daniel Murray, Dr. Morgan Reimer, and Dr.Brandon Meye, complete rigorous training, similar to doctors in medical school. They complete thousands of hours of coursework and clinical work before becoming doctors. Most chiropractic doctors have completed 7-9 years in school, with four of those in a focused chiropractic program at an accredited school. Dr. Murray, Dr. Reimer, and Dr. Meye are all graduates of the oldest and most prestigious chiropractic schools in the country, Palmer School of Chiropractic in Iowa. Many chiropractors, drawn to the field because of a passion for the mechanics of the body and its ability to self-heal, continue with postgraduate training in specialized fields such as sports injury, rehabilitation and nutrition. How does a chiropractor adjust the spine? Chiropractic doctors spend years in clinical study learning to examine the spine and to understand the complex motions of the vertebrae. An adjustment is the term for specific manipulation of one or more areas of the spine or joints. When you have an adjustment, you will be placed on a specially designed chair, table or other equipment. 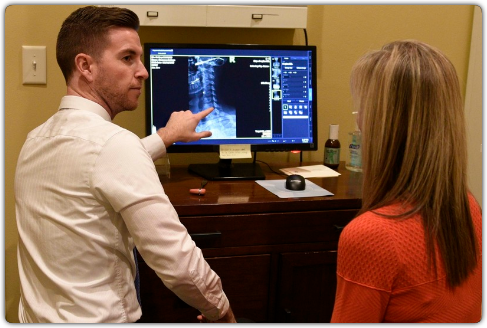 Dr. Dan, Dr. Brandon, or Dr. Morgan will then apply precise pressure, using skilled techniques, to areas of the spine that are out of proper alignment or don’t have a normal range of movement. The goals are to return a normal range of movement to the area and decrease or eliminate your discomfort. The length of treatment depends on how quickly you start feeling better and can return to doing the things that are important to you.